Signed in Singapore in February 2019, the agreements are expected to boost the agency’s Digital Park Thailand and IoT Institute Initiative under the Thailand 4.0 policy, the government's ambitious 20-year strategy to move Thailand toward a tech-centric and value-based economy. Depa signed the memorandum of agreements with Willowmore, UnaBiz, Gobi Partners, Ascent Solutions, Unity, and Spotwerkz. “These partnerships will strengthen and enhance Thailand's resources and help us gain a competitive position in the IoT industry within the Asean market. Ultimately, these agreements will improve the lives of the Thai people,” said Dr. Passakon Prathombutr, Senior Executive Vice President of depa. 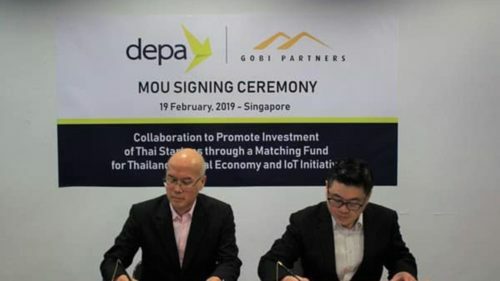 According to depa, its partnership with Unity is essential in supporting digital transformation efforts for SMEs and manufacturing as well as Thailand's creative industries in film and animation. Depa has also explored investment and development opportunities with UnaBiz, Asia's first IoT dedicated network operator in Singapore and Taiwan selling solutions in 28 countries. "Thailand is a key market in Asean to develop digital capabilities in the area of industrial automation, agriculture, tourism, education and healthcare," said Henri Bong, CEO and founder of UnaBiz.